Cenk Uygur: Well, you got that right. There’s a lot of frustation in there. Now let’s bring in Sam Seder, the host of the Majority Host Report, and Ezra Klein, Washington Post Columnist and MSNBC Political Analyst to talk about it. Sam, I don’t know if you saw the last segment, but I got a little worked up there because it looks like everybody in Washington now agrees that they are going to raise the retirement age on Social Security and Medicare. Am I the only one here that thinks that’s a disaster or do you think that’s going to make a lot of progressives angry? Sam Seder: I think it’s going to make a lot of progressive angry. I think it’s going to make a lot of Americans angry. With all due respect to the Congressman [Earl Blumenhauer], the idea that the life expectancy is going to jump 10 to 20 years over the next 30 years. The bottom line is that the life expectancy used to be measured after the age of 65. And that has barely budged in the past 100 years, and particularly even less so for the people in the bottom half of the income distribution. 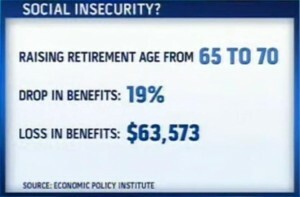 If you are going to raise the retirement age, you are cutting social security. And the idea that you are going to pretend that somehow we are going to be living to 140 years old, and everyone’s going to be doing this, and we are going to be able to work into our 70s, it’s simply not the case. And if you have to use those types of facts to justify it, then you have got a real problem with the argument. Cenk Uygur: Ezra, what’s going on here. The country wants to know. People are watching the show. They want to know. 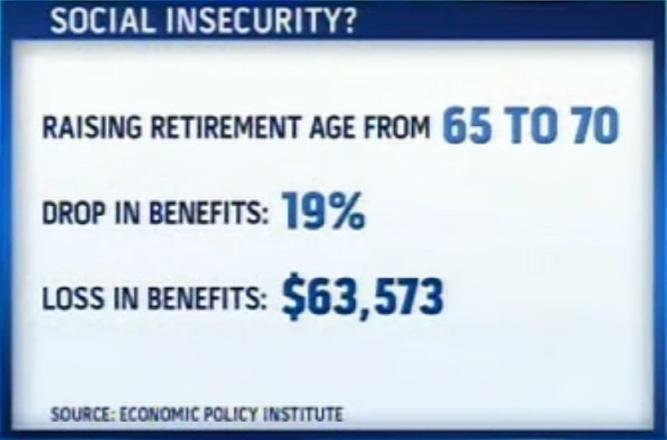 How come 84% of the country says don’t cut social security benefits, and everybody in Washington, even the AARP that’s supposed to represent these people, now say, oh, yeah, we are going to raise the retirement age and cut benefits. What the hell is the matter with Washington? Ezra Klein: It’s a popular argument here. I always think that what happens in Washington, if you look at a place like the Senate or if you look at the think tanks or other elements of the establishment, people like to work till about 75, 80, 85. You’ve got to take folks out of the Senate on a stretcher. So it sounds very reasonable to them that you would raise the retirement age above 65, and now it’s gone up to 67, and so maybe up to 68 or 69. I’m not as opposed, I think, in all circumstances to benefit cuts as you are. But it is important to say that raising the retirement age is a particularly regressive way to do it. You could means test benefits so people who don’t need it so much get less from social security. You could even do a straight [across] the board benefits cut. At least you would more clearly the effects of the policy. But essentially raising the retirement age essentially means that the people who have the worse jobs, the most menial jobs, the most physical labor, they are the ones who get hit hardest and that’s exactly what I think we should be worring about as we get near retirement age. Cenk Uygur: Sam, that’s a great point by Ezra; it goes to the heart of the problem. It seems like they don’t look out for us. And you made the point that the people who are poorer don’t live as long as the people who are richer. So they get their benefits cut the most and they got to work the longest. As you look at it from up in your roost, tell me, is this feeling of frustration with people who are supposed to be on our side, the Democrats and the White House, is that palpable over there? Sam Seder: I think my sense is that it’s been a little bit over reported that there is this type of frustration. Obviously it’s there. And I think people are starting to wonder what is it that we can do to fight this. And I think the idea is that we can’t look to our politicians. And I think Ezra is absolutely right. Our establishment lives in a bubble; you can see over the past 30 years, I think a professor from Princeton has shown, regardless of who is in office, the policy preferences of the wealthy in this country have been more or less followed. And so we have a real problem. This is just another aspect of a class war that’s being waged on the middle class. Really, we’re talking 60% of the country’s seniors rely on social security for over 50% of their income in retirement age. And so when you are talking about social security, or when you are talking about Medicaid, because Ezra knows this, what happens to many elderly is they go into homes, they are on Medicare, and then they become too poor, and so they are on Medicaid for their homes. So this is a direct assault on nearly half, if not more, of the country. Cenk Uygur: These are all great points. Ezra, when you go to taxes, you see where the problem is. We’ve got a massive redistribution of wealth. We’re at record low tax rates. And now the Republicans come along to Tim Pawlenty’s joke of a plan to reduce taxes to almost nothing for the rich. It costs us $11 trillion, the Pawlenty plan. Bachmann says that she’s pretty much in favor of it. Herman Cain, they all say they are in favor of it. So isn’t this a class war? Isn’t it the rich have declared war on the middle class and we just don’t know it? Ezra Klein: Tim Pawlenty’s plan is sort of remarkable. I never thought that anyone would make George W. Bush look like Robin Hood. He’s pretty much managed that. Is there a class war? There are competing preferences, and it is true, as it generally is, the rich have more sway in Washington. That said, I think you do have an issue, where the Democrats in general have been terrified of the tax issue. And they have not been terrified just because the rich would spend against them, they’ve been terrified because they felt that they have lost on it and Barack Obama came right in and made this terrible promise never to raise taxes on anyone making less than $250,000. and if you are never going to do that, you are not going to retire much of the debt through taxes. That’s not really going to be a serious part of the solution. And so you can’t just say it’s all the rich interests, it’s all us versus them. There’s sort of a bipartisan consensus in Washington right now that these vast majority of tax rates should not rise, and when you are not going to touch taxes, then you are going to have to hit things like Medicare, Social Security, Medicaid very hard. There are reforms that are need to happen in these programs anyway by the way, but you will have to hit them a lot harder if you are not willing to make revenues part of the solution. Cenk Uygur: There is one line that I would disagree with. There is a bipartisan consensus but it is among the rich of Democrats and the rich Republicans who agree that the middle class shouldn’t have the money, the rich should. Sam Seder: That’s exactly right. If there is a bipartisan consensus, that we can’t raise taxes on the rich, and that we should take it out of the hides of the middle class, then you are right, there is a class war. Cenk Uygur: Sam Seder, Ezra Klein, you guys are great. Thanks for joining us tonight. We really appreciate it. This entry was posted in Accountants CPA Hartford, Articles and tagged AARP admits it's open to cuts in Social Security benefits, Cenk Uygur MSNBC June 17 2011 video transcript, No more excuses, Shock headline: AARP open to cuts in Social Security, Social Insecurity?. Bookmark the permalink.